Sony's Bloodshot began to wrap production last week and now, an updated logo for the upcoming flick shows off a fancy new logo. 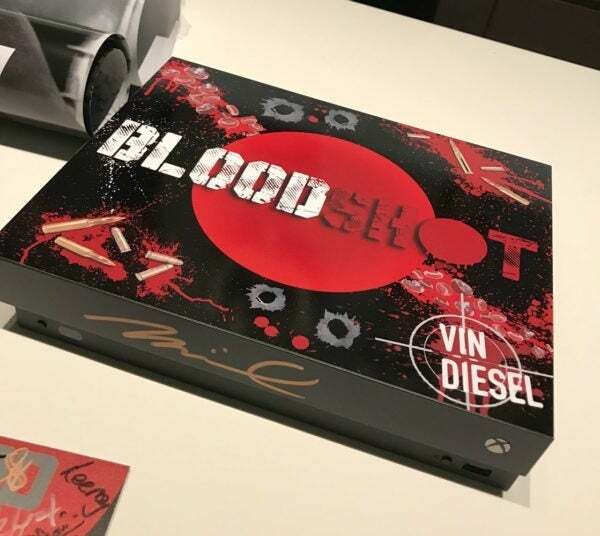 In an auction held by Game4Paul — a video game charity donating money to the late Paul Walker's Reach Out WorldWide foundation — a one-of-a-kind Xbox One showed a vastly different production logo than what we've seen before. Bloodshot star Vin Diesel had previously discussed we he decided to take up to the role of Ray Garrison. "Well first of all it was a New York Times bestseller, and there's something interesting about how the character doesn't abandon his humanity," Diesel said. "It's not heightened reality, it's based in reality. It deals with issues like post-traumatic stress disorder. The script was one of the most interesting scripts I've ever read. It plays with your mind in a way you can't...that you don't normally see in movies. It's so complex. It's so well written and so well developed." The movie will be directed by Dave Wilson on a script from scribe Eric Heisserer. Neal Moritz, Toby Jaffer, and Dinesh Shamdasani are set to produce. Shamdasani says Diesel is a perfect person for the role. "It's exactly what Vin's talking about," Shamdasani said. "The reason Bloodshot's been so popular and so successful is that he isn't an extraordinary human being who becomes a superhero. He's an ordinary guy that through extraordinary situations becomes this larger than life character, and the thing that's amazing about Vin is that even though you and I sitting here next to him and he's a monster and he's got the 'it' quality, on screen he has this amazing ability that you can watch him and say 'man, I could be Vin. I could be that guy' because he feels like us. And so that's what really works with Bloodshot. You emote with him before he becomes Bloodshot." The synopsis for the film can be read below. "Bloodshot follows Ray Garrison aka Bloodshot, a deceased soldier resurrected by weapons contractor Rising Spirit Technologies through the use of nanotechnology. Suffering from total memory loss but imbued with an array of staggering new abilities, Ray struggles to reconnect with who he was while learning what sort of weapon he has become...aided by a team of fellow augmented combatants codenamed Chainsaw." Bloodshot hits theaters in early 2020.